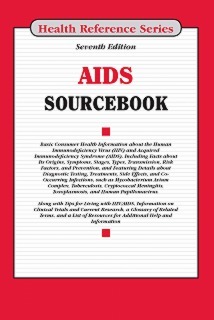 AIDS Sourcebook, Seventh Edition, provides basic consumer information about the human immunodeficiency virus (HIV) and acquired immunodeficiency syndrome (AIDS), including information about the stages of the disease and about how it is transmitted. It includes guidelines for preventing disease transmission and details about how it is diagnosed and the various drug regimens used in its treatment. Information on co-occurring infections, complications, and tips for living with HIV infection are also included. The book concludes with a glossary of related terms, a list of resources for additional help and information and includes online access. Part I: Basic Information about Human Immunodeficiency Virus/Acquired Immunodeficiency Syndrome (HIV/AIDS) defines HIV and AIDS, briefs up about what is known regarding the origin of the virus, symptoms, and facts. It describes the life cycle, stages, and types of HIV infection, and explains how HIV causes AIDS. It also includes a brief discussion of the prevalence and incidence of HIV and AIDS in the United States and especially among specific populations. Part II: HIV/AIDS Transmission, Risk Factors, and Prevention presents the facts about the transmission of the human immunodeficiency virus and debunks some of the rumors about how this infection is transmitted. It explains the factors that put people at risk for HIV, provides tips for avoiding these risks, and answers questions related to transmission, risk, PrEP, and prevention. Part III: Receiving an HIV/AIDS Diagnosis describes the different types of HIV testing and explains consumer rights regarding confidentiality and counseling. It provides a detailed explanation of what the test results mean and how to determine if you have AIDS. It provides tips for choosing a provider and navigating the healthcare system and concludes with answers to frequently asked questions on testing and window period. Part IV: Treatment and Therapies for HIV/AIDS gives an overview of treatment options, details the antiretroviral treatment process, describes the common side effects and complications of this treatment, and explains how the effectiveness of treatment is monitored and what to do in the event of treatment failure. It also discusses complementary and alternative HIV/AIDS treatments, other treatments currently being developed including the ones which are being researched, and how treatment varies in the special cases of children and pregnant women. It also offers information regarding paying for HIV care and provides answer to questions pertaining to treatment. Part V: Common Co-Occurring Infections and Complications of HIV/AIDS describes the bacterial, fungal, parasitic, and viral infections that often accompany HIV and AIDS. It also offers tips on how to avoid these infections and explains how they are treated when they do occur. In addition, AIDS-related cancer, wasting syndrome, HIV-associated neurocognitive disorders, and other AIDS-related health concerns are discussed. Part VI: Living with HIV Infection offers advice on coping with an HIV/AIDS diagnosis and explains how diet and exercise can help maintain health. It discusses legal responsibility for disclosure and provides tips for telling a spouse or sexual partners, family and friends, co-workers, and healthcare providers about HIV status. The part concludes with a discussion about laws that apply to people with HIV and a description of the public benefits, insurance, and housing options available, including information about providing home care for someone with AIDS. Part VII: Additional Help and Information includes a glossary of terms related to AIDS and HIV and a directory of resources for additional help and support.